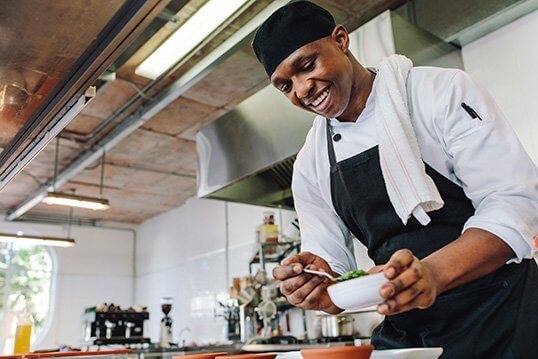 If you’re taking cooking courses online, Thanksgiving is an opportunity to show off your developing skills for family and friends. Preparing a feast of classic dishes like turkey and mashed potatoes is a fantastic way to bring people together while exploring bold, satisfying tastes. Of course, no Thanksgiving dinner plate is complete without stuffing. While stuffing is unquestionably a staple of the Thanksgiving dinner table, there’s some room for disagreement about what to call the dish. There are very good reasons to skip actually stuffing a turkey, since there can be serious food safety issues and it slows down the cooking process. That means what we usually call stuffing is really a bread dressing, but what matters is that it’s reliably flavorful and comforting. There’s no need to reinvent the wheel when you’re making Thanksgiving dinner. Guests will love a simple, classic stuffing like the one suggested by Bon Appetit. The recipe starts with tearing day-old white bread into one-inch pieces and arranging them on a rimmed baking sheet. Place the sheet in an oven set to 250 degrees Fahrenheit for about an hour to dry out, stirring occasionally. Allow the bread to cool and transfer to a bowl. Melt butter in a skillet on medium-high heat, and saute celery and onions for 10 minutes. When the produce starts to brown, move into the bowl with the bread. Add parsley, sage, thyme, rosemary, salt and pepper before slowly pouring in chicken broth and tossing the mixture together. In a separate bowl, whisk more of the broth with two eggs. Fold the egg mixture into the bread mixture. Pour into a buttered baking dish and cover with foil. Place the dish in a 350-degree oven for 40 minutes. Then, remove the foil and bake another 40 to 45 minutes, or until the top is browned and crispy. If you want to experiment with something a little different for your stuffing this year, chef Michael Symon has you covered. He provided ABC with directions that incorporate Brussels sprouts and mushrooms. This take on stuffing is built on pieces of sourdough bread, which you’ll toast at 375 degrees for 10 minutes. After moving the bread to a bowl, saute onions, celery and celery seeds in butter and olive oil. 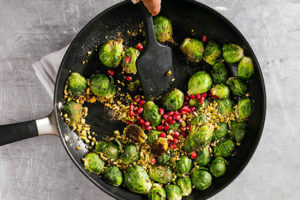 When the vegetables soften, add thinly shaved Brussels sprouts to cook another five minutes. Let the veggies cool before mixing them in with the bread. Pour more oil into the skillet and cook an assortment of mushrooms with their stems removed. Once they’re crisp and golden brown, add salt and pepper and stir into the bread mixture. Pour in chicken broth, plus two lightly beaten eggs and parsley. Stir until everything is combined, season with salt and pepper and let the mixture rest for 10 minutes. Then, transfer to a buttered casserole dish and bake, covered with foil, for 30 minutes. Take the foil off and return to the oven for another 15 to 20 minutes. Add flavorful touches to your stuffing. If you or some of your guests don’t eat gluten, that doesn’t mean you can’t enjoy stuffing. A recipe from Serious Eats substitutes in gluten-free bread without sacrificing any taste or creativity. This hearty spin on the classic dish also incorporates sweet Italian sausage, removed from its casing and browned in olive oil. Combining flavorful meat with gluten-free stock and sauted celery, onion and garlic makes for an entirely satisfying batch of stuffing. Add more flavor by incorporating basil, oregano, sage, thyme, salt and pepper. 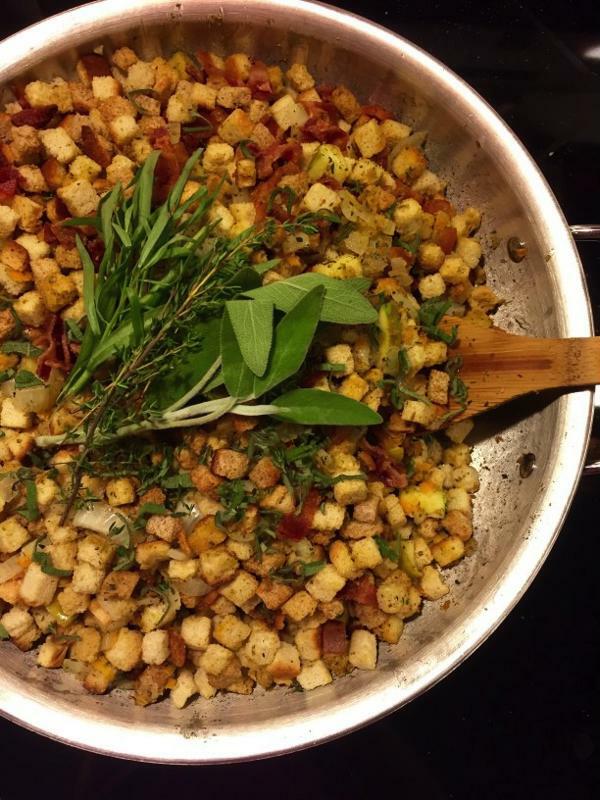 With a little creativity, a culinary academy student can make a stuffing to fit any Thanksgiving feast.